Cabo San Lucas, Mexico, offers some of the best vacation fishing you can imagine. Not only do you get to enjoy perfect weather, great shopping, and some of the finest dining on earth, you can return home with the trophy fish of your dreams. Friends and family will gladly listen as you recite the play-by-play battle required to land the monster mounted on your living room wall. Cabo fishing trips are simple to plan and easy to afford. All you have to do is book a Cabo fishing trip with the Cabo Fishing Fleet and everything else is taken care of for you by their expert guides. They offer high performance boats, some of the best fishing gear you can find, and a crew that has been featured on OLN, ESPN, and the Sportsman Channel, as well as in Sport Fishing Magazine. You simply can’t go wrong with people like this at your service. Your Cabo fishing trip can mean hopping onto a 24-foot boat and heading for secluded fishing spots known only to your personal guide. You can also board a 47-foot cruiser and get anywhere the fish are biting in style, or you might opt for a 70' luxury charter with all the amenities before you head for the open sea and the really big fish. Cabo Fishing Fleet charters provide top of the line rods and reels, storage facilities, food and beverages, and expert advice, all on beautifully sleek, well-maintained boats. One piece of advice you are sure to want to take is about your fishing line. Most Cabo fishing guides recommend using at least a 50 - 80 pound line. Heavier line may be better when you head for deeper waters. Anyone who has ever gone fishing has a story about the "one that got away," but you certainly don’t want to lose a 1,000-pound blue marlin on your Cabo fishing trip because your line wasn’t heavy enough. 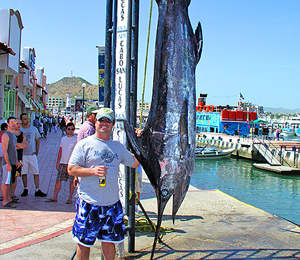 Remember, Cabo San Lucas is the Marlin Capital of the World. Cabo fishing offers a wide variety of sport fish to choose from. The cold, nutrient-rich waters of the Pacific merge in Cabo with the tropical waters of the Sea of Cortez for a perfect marriage of conditions that create ideal fishing. Whether you opt for light line tackle, deep sea fishing, or saltwater fly fishing, your Cabo fishing trip is bound to be a success. Your Cabo fishing trip will put you in place to catch bonito, roosterfish, tuna, shark, mahi-mahi, jack crevalle, carp, perch, halibut, tarpon, grouper, snapper, sail fish, and the highly prized striped marlin, among others. You can enjoy unlimited catch and release or go for that catch of a lifetime. Once you’ve caught everything you can, you have the option of having your catch cooked for you to order at many Cabo restaurants or packed for shipping. A truly remarkable option allows you to purchase a reproduction cast of your living catch and release fish that is suitable for mounting. Of course, you'll want to catch that monstrous fish, but there is plenty more to do while vacationing in Cabo. Delightful boutiques, Mariachi bands, margaritas, and incredible dining all await you in Cabo San Lucas. The beaches are pristine, the skies are bright blue, and the swaying palm trees create a perfect setting for your trip to Mexico. You can enjoy a buffet breakfast, complete with tropical fruits, an omelet made to order, and perhaps a refreshing mimosa before getting ready for your Cabo fishing excursion. Once aboard, you will experience every comfort as your crew takes you to the day’s best fishing site. After fishing, you can shower onboard, change your clothes, and get ready for a night of dancing, dining and fine wines.